My Hapi finally arrived and I installed Ravenna ASIO successfully on a Mac OS X. As for Windows, I am aware that it is suggested to use Windows 7... but I am a CS and wanted to experiment with Windows Server 2012 R2 since it is more stable and efficient IMHO. MergingRavennaASIOPanel apparently works and connects to the Hapi through the local adapter (NIC). 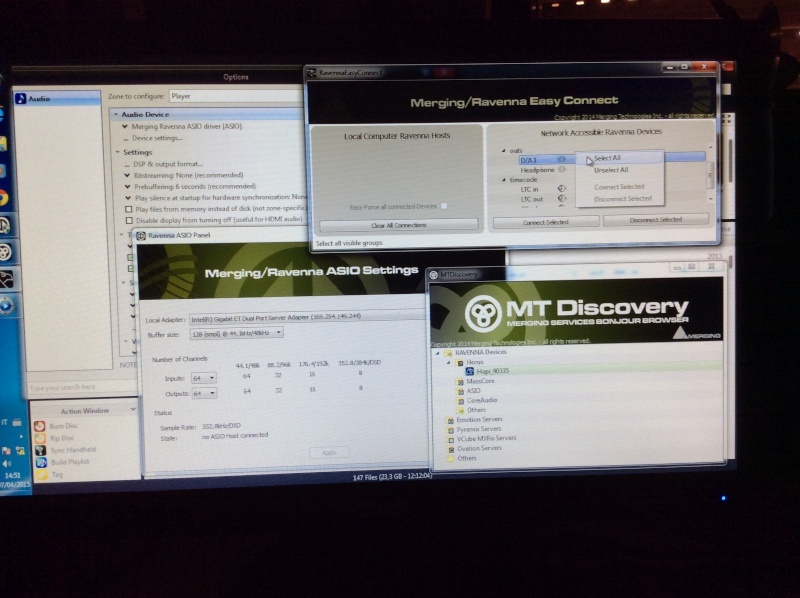 Unfortunately, the ASIO driver does not appear in MTdiscovery and hence on the left-hand column of RavennaEasyConnect, even if MergingRavennaASIOPanel is apparently giving no errors. I suspect that I should add some roles and features in "Server Manager" for Window Server 2012 R2. Any hint is appreciated. Thanks a lot. It's not clear from your message whether or not you were running an ASIO-capable application at the time you didn't see an entry for it in the Ravenna Easy-Connect panel. You will only see ASIO-enabled device entries in the MT Discovery window and the Ravenna E-C panel when they are actually running. I installed Windows 7 and got the same situation. This means that I probably succeeded in installing the drivers also on Windows 2012 R2. Last edited by robertopisa on Mon Apr 06, 2015 10:10, edited 1 time in total. I have JRiver running with a Horus. You will likely have to play around with the settings in JRiver's audio control section to configure the interface between your Hapi and the software. it's not very intuitive! In JRiver, choose Ravenna ASIO as the driver: No need for the ASIO Bridge, as that is not useful for your setup. I sometimes see those 'format not supported' messages. Often, I just clear the message and start playback again and all is well. Thanks Graemme, I did it but unfortunately it does not appear ASIO on the left-hand column of EasyConnect. I also see 'format not supported' but cannot play even if I clear the message. I wrote the MT staff, also because I would like to write a mini-tutorial on how to setup and optimise Jriver for Hapi, as it is a great opportunity. I really love this DAC. Graemme wrote: I have JRiver running with a Horus. You will likely have to play around with the settings in JRiver's audio control section to configure the interface between your Hapi and the software. it's not very intuitive! A couple of snapshots of what is going on in Windows 7. As I said before: Even though JRiver often throws up the 'format not supported' message on the first attempt at playback, try it again...works the same way every time for me. You aren't likely to see anything in the Ravenna ASIO panel's 'status' area (or Ravenna Easy Connect) until the first successful playback begins. Once playback happens, you can then connect your 'DA-1' in the Easy-Connect panel. [EDIT] You need to turn 'Bitstreaming' on in JRiver for DSD usage with Hapi / Horus. Thanks Graemme for the suggestions, but I already tried what you suggest and also what my dealer suggests. The first snapshot shows that I tried many times with JRiver and it does not work (and I set also bitstreaming). The second snapshot shows that HQPlayer goes slightly better in that it allows me to connect DA-1 through EasyConnect but there is a protocol error (see bottom right in the EC window). I have a brand-new fanless PC and the latest version of software with the most recent updates, maybe this is the issue. My dealer told me that new drivers are coming for Prolight + Sound 2015. But just saying that you have the 'latest' software, etc. isn't as helpful as telling us the exact versions you are using, including build numbers. And which version of JRiver? I could not make it work on Win 7 as it was no more a clean installation. So I decided to erase everything and install again Windows Server 2012 R2 from scratch and with renewed interest. If anyone is interested, I can write my notes here to help people to replicate my installation. I hope to have written notes for all the steps I made so that I can make a small tutorial. Windows Server 2012 R2 is very stable (standard core version with GUI) and network oriented and, IMHO, the ideal setup for Ravenna and Hapi. It works with Jriver MC20, HQPlayer, Winyl. I will test also Foobar. I cannot test Pyramix or Ovation unless MT borrows me a copy but they probably could do this much better by themselves. P,S. I can probably make it work on Win 7 as well, but I am not interested at this point. I installed Wavelab Le 7, and it works with Native ASIO Merging. Also VB ASIO Bridge works, so any app can potentially work using the latter as a sound card. Well, I've been a little too optimistic. Turns out my Win10 X64 Pro has all drivers installed (UAC down and firewall off, of course) and still, I cannot get a player like foobar to use the Ravenna ASIO driver. Battled with this in the last couple of days. Trying to run JRiver on my HTPC (Windows 10) to do real time convolution for 4-way xovers for my speakers. I tried installing a few of the recent versions of the 32 bit c++ redistributable but simply could not get JRiver (32bit) to engage with the Merging ASIO driver (64bit). I tested Reaper x64 on the same machine and it connected to the ASIO driver just fine. A big clue. The solution was to install the 64bit version of JRiver (v23), this fixed all the problems. Now JRiver is doing 8 channels of 96k IR convolution for xovers in real time and finally feeding HAPI via a single ethernet cable, no more AES/SPDIF adapters and cables.